by Chris Woodford. Last updated: January 11, 2019. When scientists "split the atom" in the early 20th century, they thought they were revealing how the world is built from basic bits of matter. What they didn't realize at the time was that they'd invented a completely new way of producing energy that would soon be deployed in atomic bombs and nuclear power plants. Ernest Rutherford, the scientist who led the early atom-smashing experiments, famously said that "anyone who expects a source of power from the transformation of the atom is talking moonshine." In one sense at least, he was correct: though it's widely used in many countries, nuclear power has proved hugely expensive and politically controversial, caused some catastrophic accidents, polluted seas, and generated horrible amounts of highly dangerous radioactive waste. Today's nuclear power plants release energy by splitting up large atoms (in what's called nuclear fission); tomorrow's plants could work using an entirely different form of nuclear power where small atoms are forced together to make bigger ones. 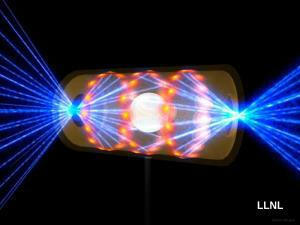 Known as nuclear fusion, this is much cleaner and safer and could potentially solve our energy needs forever. What is fusion and how does it work? Let's take a closer look! Photo: One way to make nuclear fusion is to confine atoms in a small space and then blast them with laser beams, as in this experimental setup at the National Ignition Facility (NIF) in California. More about this further down the article. Photo credit: Lawrence Livermore National Laboratory. Photo: The Earth is powered by nuclear fusion happening inside the Sun. Some time in the future, we might be able to create small-scale fusion power ourselves, here on Earth. This photo was taken by the Solar and Heliospheric Observatory (SOHO), a joint project of the ESA (European Space Agency) and NASA. Picture courtesy of NASA Goddard Space Flight Center. It's not immediately obvious, but almost everything you're doing right now (from breathing in and out to tapping away on your computer) and everything you can see around you (trees blowing, grass growing, and cars speeding by your window) is powered by nuclear fusion—because that's what drives the Sun, and the Sun drives the Earth. If you could get close enough to the Sun to peer inside its core and see what's going on inside, you'd see atoms of hydrogen joining together ("fusing") to make atoms of helium, releasing huge amounts of energy in the process. 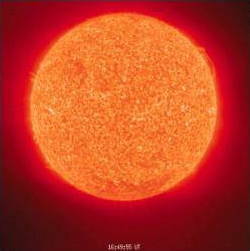 Apart from making incredible amounts of heat inside the Sun itself (the core is at a temperature of at least 10 million degrees), the Sun's nuclear fusion also produces the solar energy that streams out across 150 million kilometers (93 million miles) of space sustaining pretty much all the life we see on Earth. Now suppose we could make a machine that copied what happens inside the Sun here on Earth, only in a much smaller and more controllable way. In theory, we'd just feed in hydrogen (a simple, fairly safe gas we can make from water) at one end, smash its atoms together inside, and get helium (a clean and safe gas) out of the other end. In the process, we'd produce huge amounts of heat energy, which we could use to drive steam turbines and generators to produce electricity, much as in any conventional power plant. There'd be no pollution, no carbon dioxide (one of the so-called greenhouse gases that causes global warming and climate change), and no deadly nuclear waste. We'd have simple, clean, safe, nuclear power! Why do we need yet another kind of energy? Photo: Wind turbines can make clean, green energy, but it takes at least 1000 of them to replace a single coal or nuclear power plant. 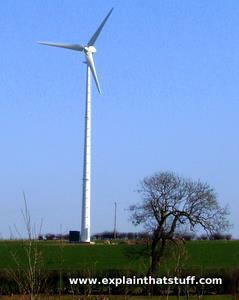 This is a relatively small wind turbine that generates peak power of just 225kW, so you would need about 9000 turbines like this to make as much energy as a large 2GW (2000 megawatt) coal or nuclear plant (assuming the turbine worked at maximum power all the time, which of course it doesn't). Typical large wind turbines generate 10 times more power than this one. The world's population is still increasing and it's expected to rise from about 7.5 billion today to about 9 billion by 2050. Meanwhile, lots of the people in developing countries who currently use very little energy may well want to use more in future as their standard of living improves. So we'll have lots more people on the planet and each one of them, on average, using more energy than each person does today. It's been estimated that the world will need perhaps 2–3 times as much energy in 2050 as it does now. About 80 percent of our energy currently comes from fossil fuels such as oil, gas, and coal. We have only limited supplies of these fuels and oil and gas (in particular) are rapidly running out. The third problem we have is that fossil fuels make carbon dioxide gas when we burn them (or use them in engines) to release energy. That's creating climate change that could ultimately make our planet impossible to live on. What's the answer? Renewable energy made from the Sun, the wind, the oceans, and other sources is one solution to these problems, but we're not building it quickly enough at the moment to make enough difference (for example, it takes thousands of wind turbines to make as much electricity as a single coal-fired power plant). If we could build nuclear fusion plants that make as much electricity as today's coal or nuclear fission plants, with none of their drawbacks, we could potentially solve Earth's energy problems forever, making all the power we need without wrecking the environment. How can we make nuclear fusion happen on Earth? There's obviously a huge difference between the center of the Sun and the inside of a power plant on Earth—so how could we make nuclear fusion reactions happen in practice? It turns out that, instead of using ordinary hydrogen atoms, the best approach is to use other isotopes (different atomic forms) of hydrogen that are slightly heavier. An ordinary hydrogen atom has just one proton in the nucleus and one electron in the space around it, but these heavier hydrogen isotopes are built differently (and are much less stable as a result). One of them, known as deuterium, has one proton and one neutron in the nucleus and one electron in the outside space. The other, called tritium, has one proton and two neutrons and one electron outside. Smash together an atom of deuterium and an atom of tritium and the bits we have to play with are two protons, three neutrons, and two electrons. From these, we can make one very stable atom of helium (which has two protons, two neutrons, and two electrons) and have one neutron left over. By converting two unstable atoms (one each of deuterium and tritium) into one stable helium atom, we release a great deal of energy. Now what we have here sounds a little bit like a chemical reaction, where we might react something like sodium metal with chlorine gas to get sodium chloride (table salt). Chemical reactions can release energy if the products (the things you end up with) are more stable than the reactants (the things you start off with). However, you get much more energy out of a nuclear reaction (where the atoms you start with are changed into completely different atoms) than a chemical reaction (where the atoms retain their identity but join or rearrange into different molecules). That's because the amount of energy needed to hold the nucleus of one atom together is vastly greater than the amount of energy involved in binding two different atoms together. Atoms are (generally) stable things, so if you want to break one apart you have to use energy to do it. The energy you need is equal to the energy that holds the thing together in the first place; and it's called the binding energy. It's the source of the energy we can make by joining small atoms together or splitting big ones apart. It's where nuclear energy comes from. Artwork: Nuclear energy is released when small atoms join into bigger ones (fusion) or bigger ones split into smaller ones (fission). The nucleus of an atom sticks together for the simple reason that it's more stable than its component parts. When those parts come together, they release energy. Where does the energy come from? The mass of a nucleus is less than the mass of the things (protons and neutrons or "nucleons") it's made from. The difference between the two masses (the mass defect) is equal to the binding energy. That sounds a bit confusing, but it follows directly from two things. First, Einstein's idea that mass and energy are equivalent (famously represented by the equation E = mc2). Second, the law of conservation of energy: we can't destroy mass or energy, only change them into other forms. So the "missing mass" accounts for the energy we gain. In nuclear fission, we split large unstable atoms into smaller, more stable ones and release binding energy. In nuclear fusion, we join small unstable atoms into larger, more stable atoms, and also release binding energy. The reason energy is released is different in the two cases. Particles in the nucleus of an atom are affected by two main forces, the strong nuclear force (attractive and powerful over short distances), which pulls them together, and the electromagnetic force (repulsive and more powerful over longer distances), which pushes them apart. Small atoms can make themselves more stable by clumping together into bigger ones to maximize the benefit of the stronger nuclear force. Big atoms can make themselves more stable by splitting into smaller ones to reduce the repulsive electromagnetic force. Fusion happens because of the former; fission because of the latter. This suggests medium-sized atoms are going to be the most stable—and that turns out to be true. Nickel-62 is the most stable (it has the most binding energy per nucleon) and iron (another medium-sized atom) isn't far behind. That's why iron—very stable—is also so common on Earth. How much energy is released in a fusion reaction? How would nuclear fusion plants work in practice? As we've just discovered, the basis of nuclear fusion on Earth is converting deuterium and tritium to helium, with a big release of power as two unstable atoms rearrange themselves to make one stable atom. It sounds simple enough, but no-one has yet managed to make fusion work on a big enough scale to generate commercial amounts of power. That's because there are huge practical difficulties involved. 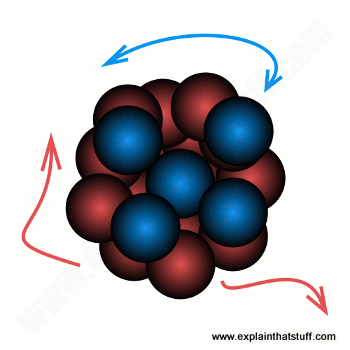 To make two atoms fuse, you have to push their nuclei closer and closer together. The trouble is, the nucleus of every atom has a relatively large positive, electrical charge so two nuclei repel one another in much the same way as the north poles of two magnets ("like poles repel"). The nearer the nuclei get, the more energy it takes to get them any closer—and the amount of energy keeps on increasing. In fact, the repulsive force between two nuclei quadruples every time you halve the distance (if you're interested, that's because of Coulomb's Law). In practice, this means you have to use a vast amount of energy to make atoms fuse together in the hope that you can release even more energy in the end. So far, scientists have not even got to the point where they can "break even" (release anything like as much energy as they use). That's why nuclear fusion is currently being studied only in scientific laboratories and why, for the moment at least, it's not a practical or viable source of power. What are scientists actually doing in those fusion labs? To make atoms fuse, we have to heat them up to make plasmas (ultra-hot soups of gases in which the atoms get so hot that they're blown apart into their constituent nuclei and electrons), then hold them tightly together in a confined space at temperatures at least as hot as you get in the center of the Sun. So the problem of generating energy by fusion becomes a slightly different one: how can we confine a super-hot plasma so it stays hot and energetic enough for the atoms inside it to overcome their natural repulsion and fuse together? Artwork: Magnetic confinement: In a tokamak, plasma (gray) is confined in a donut shape by electromagnet coils (orange and black). In stars like the Sun, gravity is the force that achieves this. On Earth, we have to achieve the same end artificially and there are two basic ways to do this. In one method, called magnetic confinement, deuterium and tritium are heated to sun-core temperatures of about 100 million degrees. Then a super-strong magnetic field is used to trap them in a donut-shape known as a torus. A machine that does this is known as a tokamak, a word coined in Russia for just this piece of apparatus (the biggest in the world is currently operating at a lab known as JET, Joint European Torus, a few km/miles south of Oxford in England). 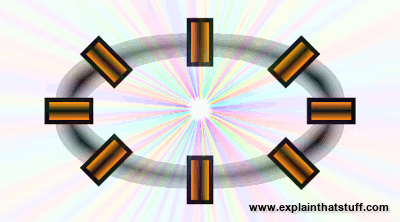 The other method of fusion is called inertial confinement and involves firing a powerful laser at a pellet of fuel so the atoms inside it are instantly heated and fused together. The fuel burns before it can blow apart, so its own mass (and therefore inertia) is effectively what confines it. One example of this technique is being used at NIF (National Ignition Facility) at Lawrence Berkeley National Laboratory in California, where 192 laser beams (collectively making the world's biggest laser) are fired simultaneously at a tiny fuel pellet to create the right conditions for nuclear fusion. 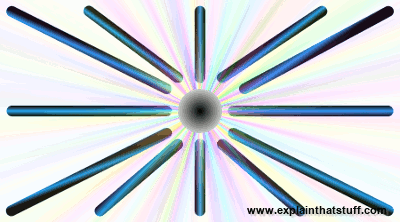 Artwork: Inertial confinement: Multiple lasers (blue) converge on a fuel pellet (gray) to bring about fusion. Impressive though they are, JET and NIF are still just lab experiments. Hopes of achieving anything like commercially viable fusion are now pinned on another international project known as ITER, currently under construction in southern France. Once complete, in 2019, it should be able to generate about 10 times more energy than it consumes for up to about 8–10 minutes. Even that, which will be a major achievement, will be far short of generating fusion power hour after hour, day after day, and year after year. But it's a start! Nuclear fusion offers great promise for the future: huge supplies of clean energy made from readily available fuels that are effectively unlimited. It generates no nuclear waste or pollution (other than reactor equipment, which remains contaminated at the end of its life for about a century) and no greenhouse gases. There's no risk of nuclear accidents similar to those that have occurred with fission plants (in horrific incidents such as at Chernobyl, Ukraine in 1986 and Fukushima, Japan in 2011). On the negative side, scientists estimate we're still several decades away from seeing commercial fusion plants. It's only a matter of time before fusion plants are making some of our daily electricity, but can we develop them fast enough before Earth's energy crisis, and climate change, really hit home? Culham Centre for Fusion Energy: Home of the JET project in Oxford, England. General Fusion: A small-scale fusion project that uses elements of both magnetic and inertial confinement. ITER (International Thermonuclear Experimental Reactor): The successor to JET, located in France. NIF (National Ignition Facility): Laser inertial confinement project at LLNL in California, USA. Fusor.Net: The Open Source Fusor Research Consortium: An online meeting place where amateur fusion scientists swap techniques and share ideas. A Piece of the Sun: The Quest for Fusion Energy by Daniel Clery. Overlook Press, 2014/Duckworth, 2013. Light on science, but a comprehensive review of how engineers have pursued the dream of nuclear fusion. Fusion: The Search for Endless Energy by Robin Herman. Cambridge University Press, 1990. An entertaining history of fusion research, from Lyman Spitzer's secret Princeton experiments, which launched Project Matterhorn in 1951, to the Fleischmann–Pons, cold fusion fiasco of 1989. Unfortunately, since the book was published in 1990, it omits everything that's happened since then. The Fusion Quest by T. Kenneth Fowler. Johns Hopkins University Press, 1997. A historic, inside account of the quest for fusion from a former nuclear researcher at ORNL and LLNL. Fusion: The Energy of the Universe by G. M. McCracken and Peter E. Stott. Academic Press, 2012. A great introduction that starts with the basic concepts of fusion in the Sun and stars and energy from mass, examines man-made fusion, then reviews different approaches to fusion on Earth, including magnetic and inertial confinement. Nuclear Fusion: Half a Century of Magnetic Confinement Fusion Research by Cornelis Braams and Peter E. Stott. IOP, 2002. Historical review of attempts to achieve viable fusion power since the mid-20th century. Nuclear fusion on brink of being realised, say MIT scientists by Hannah Devlin. The Guardian, March 9, 2018. MIT and Commonwealth Fusion Systems believe they can deliver fusion power to the grid within 15 years with a new technique that uses more powerful magnets. Startup: LPPFusion Embraces Instability by Mark Anderson. IEEE Spectrum, September 22, 2017. Exploring a new approach to fusion called Dense Plasma Focus (DPF). Three Alternative Fusion Projects That Are Making Progress by Mark Anderson. IEEE Spectrum, November 18, 2015. Giant, big-budget tokamaks aren't the only hope for achieving nuclear fusion; small-scale research efforts are approaching the problem from different directions. Start-Ups Take On Challenge of Nuclear Fusion by Dino Grandoni. The New York Times, October 25, 2015. Can energetic startups find the holy grail of fusion where governments and universities have so far failed? How Far Can Crowd-funded Nuclear Fusion Go? by Mark Anderson. IEEE Spectrum, July 15, 2014. Why Focus Fusion is exploring a process called proton-boron fusion, long abandoned by mainstream researchers. Machinery of an Energy Dream: The Challenge: How to Keep Fusion Going Long Enough by Kenneth Chang. The New York Times, March 17, 2014. A good review of NIF, ITER, and other current fusion projects. Giant laser experiment powers up by Jonathan Fildes, BBC News, 31 March 2009. A look at how NIF works and what it hopes to achieve. This Machine Might* Save the World (* that's a big, fat "might") by Josh Dean, Popular Science, 23 December 2008. How General Fusion is attempting to create nuclear fusion on a small scale.